Caltex and Robinsons Malls are two of the most respected and known brands in the country. I know for a fact that almost everyone I know has at one point gassed up at Caltex while the rest have definitely visited a Robinsons Mall. This is why the collaboration between the two brands is very exciting and definitely news worthy. Robinsons Rewards Card (RRC) members willenjoy earning more points not only when they shop attheir favorite Robinsons stores but also when they fuel up at Caltex. RRC members can now use their points to redeem P1 discount for every one liter fuel purchase at participating Caltex stations nationwide. Every five liter gas up earns a point which meansthat the more customers fuel up at Caltex and shop at Robinsons, the more points for fuel and shopping savings. Chevron Philippines Inc. (CPI), marketer of Caltex fuels and lubricants, teamed up with Robinsons Retail Holdings, Inc. (RRHI), the second largest multi-format retailer in the Philippines, to create a unique offer that allows customers to quickly and continually add value to their purchases by gettinga variety of fuel and shopping rewards through their RRC. Because ofthis loyalty program partnership, motorists now have more reasons to choose Caltex.Customers can save more on fuel costs when they purchase Caltex with Techron plus the five benefits of maximized power, improved fuel economy, lower emission, smoother drive and reliable performance. 1. All valid Robinsons Rewards Card (with 16 digit numbers and gold magstripe) shall be accepted in participating Caltex service stations for the Caltex-Robinsons Rewards Loyalty Program (“Program”). 2. Caltex gasoline and diesel purchases via cash, credit card, debit card, StarCash or StarCard can earn and redeem Robinsons Rewards Points. 3. The Robinsons Rewards Card can be used for a maximum of two (2) fuel purchases per day. The Robinsons Rewards Card cannot be used with any other existing loyalty partnership or program involving Caltex. 4. For a complete list of participating Caltex service stations, visit http://www.caltex.com/ph/. 5. Points earned at participating Caltex service stations may also be redeemed at participating Robinsons Stores nationwide, visit https://www.facebook.com/RobinsonsRewardsCard for a complete list of participating stores. a. Cardholders shall earn one (1) Robinsons Rewards Point for every five (5) liters eligible fuel purchase, up to a maximum of 60 liters per purchase. b. Cardholders shall earn applicable Points for purchases of up to 500 liters per month. a. A minimum balance of 50 Points is required before a cardholder may begin to redeem points. Cardholders may redeem less than 50 Points per fuel purchase. b. Cardholders can redeem one (1) Point for every liter of fuel purchased. Each Point redeemed entitles the Cardholder to a Php1.00 discount per liter. c. The Cardholder can redeem a maximum of 60 Points per fuel purchase. d. Any fuel purchased in excess of Points redemption shall be eligible to earn Points. • New balance after deducting Points redeemed shall be 79.50 Points. • Fuel purchase of 5 liters (in excess of Points redemption) shall earn 1 Point. • New balance after deducting Points redeemed and adding Point earned shall be 1 point. B and I recently went out. 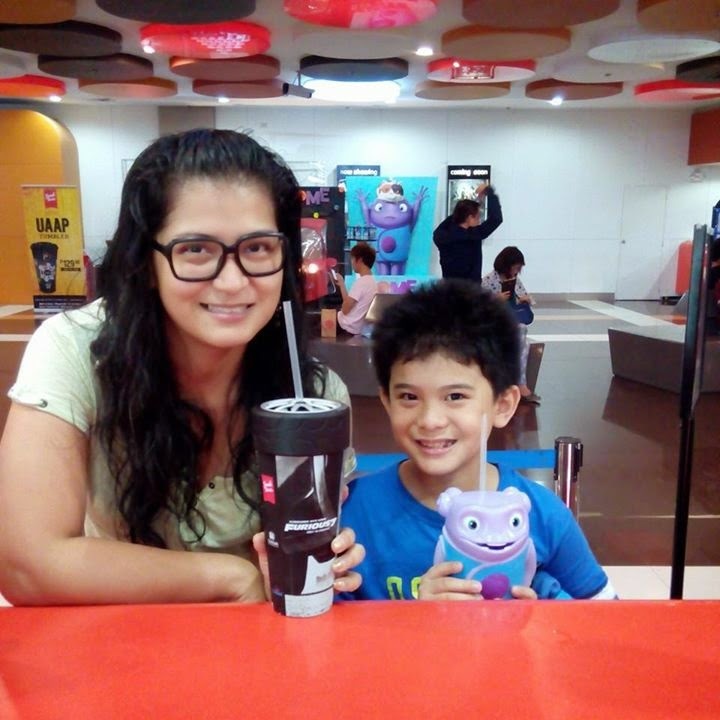 It has bee quite some time since we had one of our dates so when HOME was shown in cinema houses, I promised him that I would make time to watch it with him. Thankfully, I was able to keep my promise. 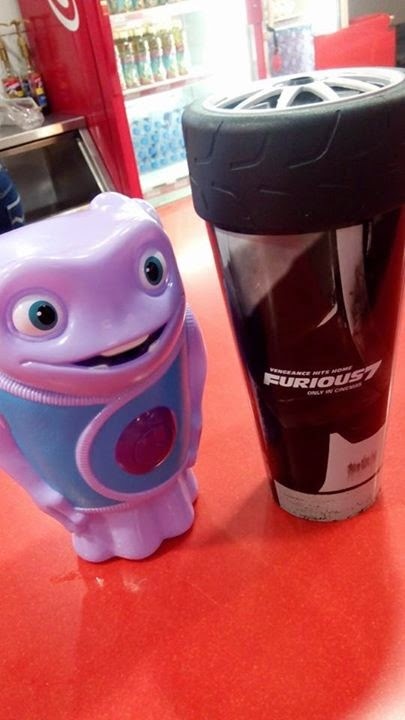 After we bought our tickets, I saw these tumblers and since I love these silly little things, we both got one each. We also brought half a dozen of donuts to eat inside the cinema. I had no idea that it was also going to serve us our dinner. I would have chosen something more filling if I had known. B had 4 donuts and I had 2. The movie was very entertaining and definitely had me roaring with laughter especially during the dancing part. I loved that B was very into it and was also laughing with me. I hope to have more movie dates with him and I hope that he grows up loving these little dates that we have because I surely value it. Love you B. It was a night to remember. It was a night that would test my skills and ability to execute something from start to finish. To say that I was nervous would have been an understatement. I was a wreck and my mind was blank when I got to the venue. I didn't know the look I was aiming for and I had no idea how things would be laid out. In short, I felt like I did not know what I was doing. Thankfully, when I actually stood in the middle of the venue, things just started falling into place in my head. The random things that I bought but did not really know where to place and how to use just laid itself out beautifully. When the guests started arriving, I was very happy because from the time the first guest arrived, it was 5 minutes after I was done with all the finishing touch. However this night wouldn't have been possible without the following sponsors. I am so grateful to these people for giving me their trust and sponsoring the giveaways and raffle prizes for the night. It definitely added more glam to the night. 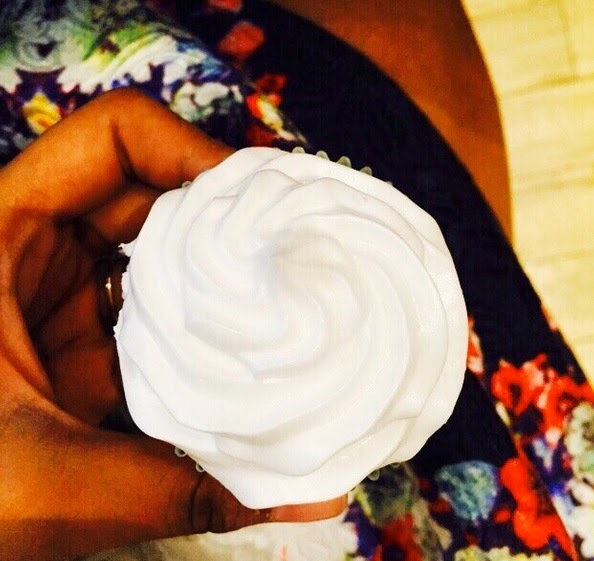 The cupcakes from The Sugar High were devoured in an instant and the cake was simply stunning. The items from Tony Moly were met with excitement and glee while the GC's from Stella Rocket Room and Love Desserts were coveted. Of course, the true stars of the night were the guests and Dra. Kaycee Reyes who ensured that the night would be filled with glitz, glamour, and a whole lot of fun. People came in not knowing each other and left the place with new found friends. Thank you for making my biggest event a success everyone. I am forever grateful. Four Seasons Hot Pot is currently the hottest thing in town, both literally and figuratively. 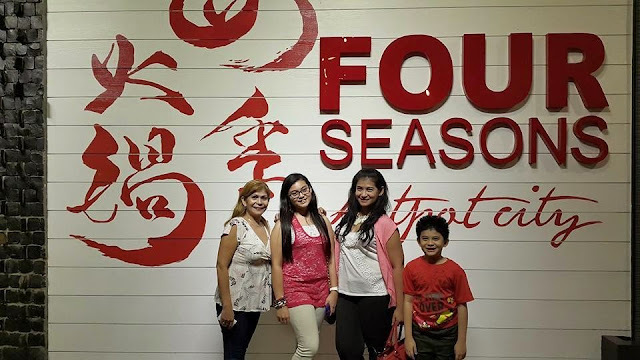 Coming from a family of foodies and being Chinese, it was a given that we would celebrate my sisters birthday at this place. First impression: It was well lighted, the placement of each section was really good, and it did not feel small at all. The place was not too big yet they managed to make the place feel like it was 3x more than its size. I also love that the signage was very big and really easy to read, even from afar. They have a wide selection from seafood, meat, premium food, drinks, and veggies among other things. They also have unlimited champagne for a small fee. Trust me, they have a pretty good range of champagne. If you are a group of at 10-12, you can also book the private room where you can laugh to your hearts content without bothering other diners. My personal favorite was the seafood section. They had sea mantis, shrimps, different kinds of shells, and abalone. The only thing they didn't have was lobster but for Php800 per head, we can't really expect lobsters as well right? What I loved about Four Seasons Hot Pot was that it also offered sushi, Chinese food, and other viands. It wasn't just a hotpot. As for the hotpot, they had 6 kinds of soup to choose from which will serve as your base soup. We loved the dining experience here at Four Seasons Hot Pot. Fresh food, healthy soup, attentive staff, and really spacious place. What more can you ask for? When I saw the words Master Chef in the invitation, I knew that I would be crazy not to go. I have never tried a meal cooked by a master chef or even one where the recipe came from master chef so I knew that this would be a totally new experience for me. From the press kit that was given to us, this was what I read. On 27 March and 28 March, the star of 3 Chefs 1 City, which premiered on AFC, will host a private lunch at Benjarong, DusitThani Manila, featuring an elegant 6-course menu of inspired Thai dishes with a unique gastronomic twist. Guests can look forward to tasting his interpretation of Tom KhaGoong – a light galangal coconut soup served with seared tiger prawn; diced tuna tartare with ginger, betel leaves, palm sugar and a fish sauce dressing; slow cooked beef short ribs in green curry sauceandjasmine panna cotta for dessert. Chef Kittichai will also host a public cooking demonstration on 28 March to be held at the Atrium of Eastwood Mall. Fans will get a chance to get up close and personal with Chef Kittichai, and taste his famed Grilled Beef Salad– one of the most popular dishes from his flagship restaurant, Issaya Siamese Club in Thailand. This is what we had in store for us. The event started with one of the loveliest hosts in the country, Miss Gelli Victor and that was already a hint for me that it would be one class act. After she explained what was in store for us, she called on Chef Ian Kittichai who was one of the most humble chef that I have ever met. He explained to us a bit about his background and then proceeded to demonstrate how to make Grilled Beef Salad. I have to say that it is always amazing to watch the experts make a dish. They make it look so effortless and pretty. When I try doing it, it is almost always a disaster and definitely not pretty. Everything that they served that day was simply delicious. I can honestly say that this was the most delicious meal I have ever had in my entire life, from appetizer to dessert. A lot of us kept saying "can we have another round please?" If it was a buffet, we'd definitely go for 3rds and 4ths. It was just so good. The Ma-Hor which is a caramelized minced shrimp ball with peanut and served on top of a pineapple slice was pure heaven. It went into my mouth and boom, explosion of flavors. I actually literally gasped. It was just SOOOO GOOD. The Meint Tuna was also pretty good with its diced tuna tartare, ginger, betel leaves, and palm sugar fish sauce dressing but the winner of this round was definitely the Ma-Hor. Now I was pretty hesitant with the Tdom Kha Goong because I love this dish. I fell for it when I was handling a Thai restaurant and it has become my baseline for all Thai restaurants. This one toppled over my favorite to number 2. The shrimps were super fresh. I actually felt like they were alive when they hit the pan. They were just so juicy and fresh. Did I say they were fresh? The soup was very tasty and truth be told, I wanted to lick the bowl just to get every single drop. Hahaha. I didn't though. My poise got the better of me. The Beef in Short Ribs with Green Curry Sauce was the spiciest amongst everything that was served but it was also one of the tastiest. I could have paired this with 10 cups of rice and still eat more. It is one of those dishes that I felt was best served with rice. The beef was very tasty and soft. You barely needed to chew it. Finally, dessert came in and soon as the dish passed by my nose, I felt like I was sitting in a garden surrounded by Jasmine. This Jasmine panna cotta and ice cream actually beat the Sampaguita Ice Cream I've had. The experience was more powerful and it really transports you to places. One moment I felt like I was in a jasmine garden and the next I felt like I was back in the olden days and I saw my grandmother putting on perfume and this was the exact same smell. I am so thankful that I was able to taste Chef Ian Kittichai's dishes. They really are a gastronomic delight. Seriously. They really are. “Taste of Thailand with Ian Kittichai” is a regional culinary tour that visits the Philippines, Malaysia, Singapore and Vietnam.In the Philippines, the tour is proudly presented by the Asian Food Channel and supported by Megaworld Lifestyle Malls, Center for Culinary Arts Manila, Imarflex, Saeco, and Eastwood Mall. For more information, please visit http://www.asianfoodchannel.com/celebcheftours. Catch Chef Kittichai in 3 Chefs 1 City on AFC, every Tuesdayat 9.00pm, on SkyCable, Channel 22, Dream Satellite TV, Channel 27, Cignal, Channel 26 and Destiny Cable TV, Channel 71 (Analog) and Channel 22 (Digital). I was recently invited to the launch of F&B Report. Being someone who dabbles in food writing from time to time (I would never claim to be an expert for I just simply love food but have never really studied it,) I was very excited to be there for the unveiling of F&B Report's very first issue. I wanted to know if it was different from the normal food magazine and if it was actually something worth buying and reading. Upon arriving, I was seated with people whose names I only heard of before. To say that it was such an awesome experience would be an understatement. I learned so much listening to these people talk about food and culture as well as their travels in their quest for food. I realized that whatever "knowledge" I may have is very tiny compared to theirs. I realized that if this is the kind of crowd that the launch of F&B Report can draw then I know that the magazine that I am about to hold in my hand will be worth every peso I'll spend on it. The passion is there, the zest for food and life, and the spirit was just everywhere. After an hour or so of mingling, the unveiling finally happened. I loved it. It was very different from the usual food magazine. It reminded me of the golden days when people would actually flip over pages when reading things and you could smell the paper. The layout was very nice and the text was easily readable. There was none of the glare you get from the light when it hits a glossy page. I asked the new Editor in Chief Angelo Comsti to sign my copy because I know and I believe that this magazine will make history. The passion he showed when he gave a short speech makes me believe that he will move heaven and earth to show people what great food really is through his magazine and he will show the world what real Filipino cuisine is all about. Now this is a passion that I can share. The who's who of the food industry came and showed support. All around I could hear praises and compliment for the F&B report launch which is always a good sign of things to come. I felt honored to have been part of the chosen ones to have read the magazine on its launch. I've actually just finished reading it now and I can say that the articles are all well researched, interesting, and presented in a new light. You will definitely not say that it is the same article that you've read somewhere else. It's fresh and it gives new insight on old things. I am looking forward to reading the May issue and sharing it with my readers. I'll be writing another piece on the magazine itself because this is something that I feel I need to share. On its first issue, F&B Report celebrates a milestone in Philippine culinary history as Manila plays host to the biggest gastronomic event in the world: Madrid Fusion 2015. This, along with the presence of more Filipino restaurants abroad, international features on traditional Filipino dishes like kinilaw, appreciating the foundations laid by local culinary icons, and recognition of Filipino chefs in the global stage, is finally putting Filipino cuisine in the spotlight. With these changes, HIP endeavors to reinforce F&B Report as the country's first and most authoritative food service and industry magazine that feeds readers with the most current and relevant news, insights, and innovations in the food and beverage world. Ever since B started with school, he has always moved up in the Top 3. He would get medals for Best in this and that and he would always be 3rd honor. This year, the year that I would always hear him say he's struggling a little with this and that, he moved to the 4th grade and received 2nd honor. Yes, you read that right. B ended his 3rd grade in school as 2nd honor. AMAZING. I am not saying he is amazing because he is my son. He is amazing because he self studies and we rarely have to prompt him to study. He knows the value of education and I sincerely pray and hope that he will never change this. 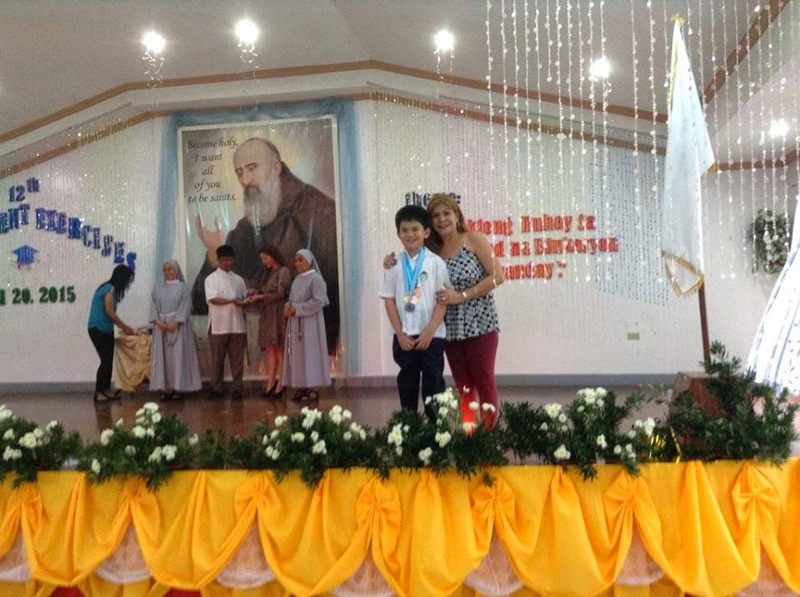 During the awarding for his 2nd honor, I wasn't able to make it but my Mom went on my behalf. I am so grateful that my Mom always has my back. One of the things I look forward to is attending a talk about pursuing dreams and passion. I feel that with so much negativity around, it needs to be a conscious effort to listen to positive things and to make an effort to know how to go about roadblocks and challenges in life. When I was invited to listen to Mr. Ardy S. Abello, I was ecstatic. I immediately said yes because he is one of the best in his field. He is a top-ranked motivational speaker, a hi-impact trainer and a Director of Business Works.In 2012, Salt and Light Ventures and Asian Center for Trainers and Speakers (ACTS)awarded him as the “Highest Rated Speaker” for In-house Seminars. 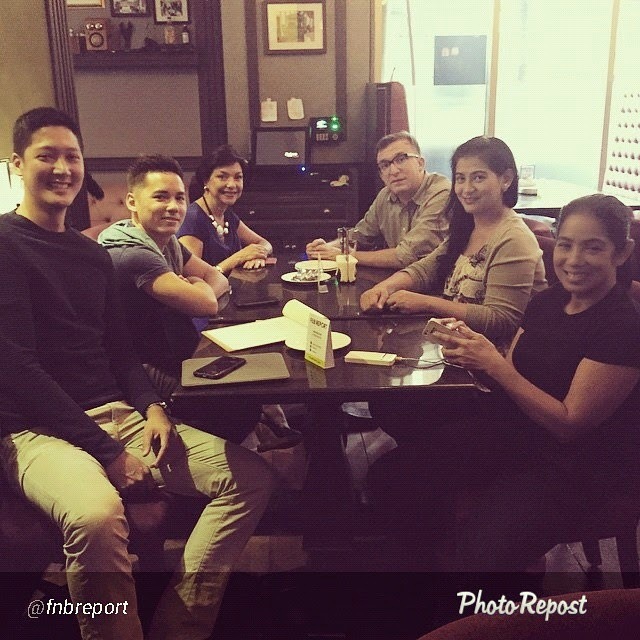 Ardy Abello surpassed over 40 speakers and trainers in that category. 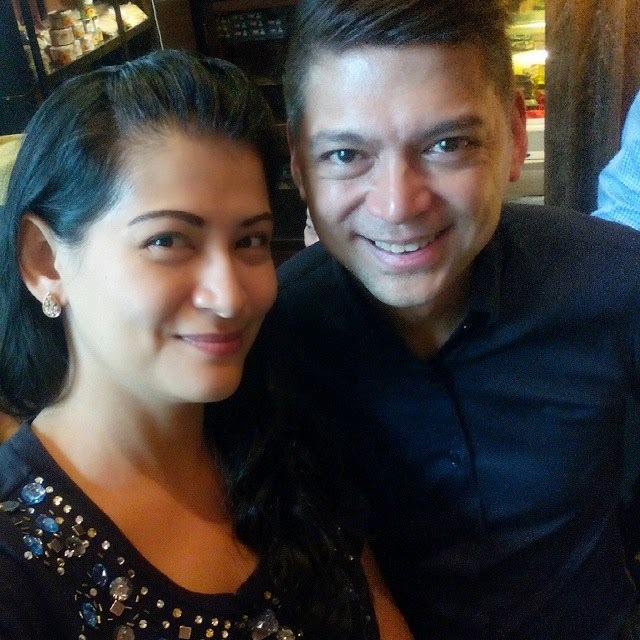 For over a decade now, he has been involved in training, consulting and in recent years, coaching executives and the top management teams of different companies belonging to the Top 100 corporations and multinationals in the Philippines. Ardy Abello has keynoted in corporate sales rallies, conventions and conferences on various topics such as Leadership, Team Work, Top Performance, Work-Life Balance and many more. He was a speaker at the Million Dollar Round Table (MDRT) World Conference in Atlanta, Georgia. He was the only Filipino among 50 speakers to be invited to speak in this prestigious event participated in by over 6,000 of the top life insurance agents worldwide.Ardy Abello is a member of the American Society for Training and Development, an international organization involved in the holistic development of individuals and teams for top performance.He is currently the Main Speaker and Lead Facilitator for the workshop entitled, “Developing The Leader Within You” through INSP!RE Leadership Consultancy.He is the author, designer and lead consultant of Performance and Leadership workshops such as Aim High, Heart of Leadership, Mindset of a Champ, Coaching for Breakthrough Performance and many more engaging topics. In this talk that I attended, he taught us the 4 C's to make a successful team. Connection, conduct, core values, and character. He also taught us that with the word motivation, if you put a litte creativity to it, you would see that it speaks of motivation + action. Lastly, to do well in a one hour presentation, one must prepare for a lifetime. With the rising price of real estate, condo living has become more popular with home owners. Instead of paying a high price for a piece of land, people are opting in to buy condo units rather than purchase land and have a house built. However, because it costs considerably less than most properties, condo units also tend to be a little more cramped or limited than living in a house. This is where ERGO Homes come into play. Recognizing the need for storage within a limited space, they have come up with multifunctional furniture that not only serves a purpose but can also be used as decoration inside the house. Everything you see in the photo serves 2 or more functions and can be moved from one end of the room to the other. It really is quite fashionable and handy all at the same time. You can buy the furniture as a set or individually. Personally, I would just buy all of it in one go; this way I won't need to worry about making things fit with my other furniture. Another thing I love about ERGO Home is that it not only caters to families and homes but also to businesses because the styles are functional a well. ERGO Home is located on the 2nd floor of Mall of Asia near the Bay area. 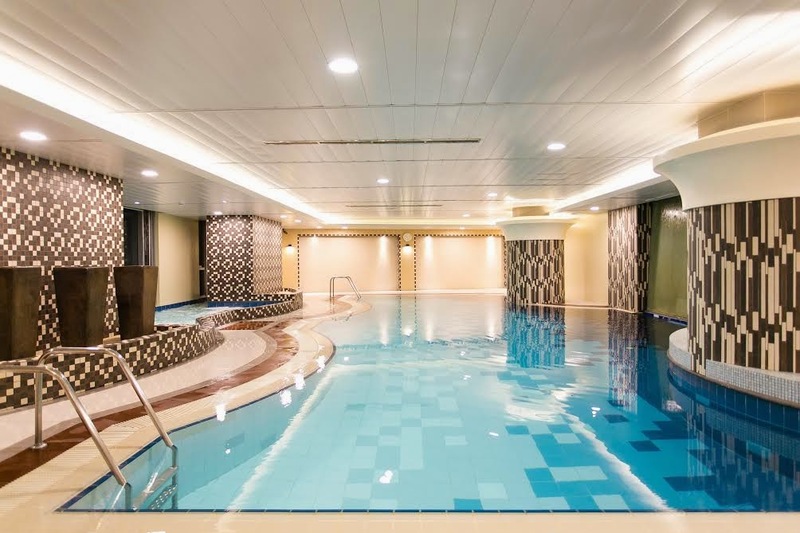 The Linden Suites is situated right at the heart of Ortigas Center which makes it a perfect staycation place for those who need a respite but can't afford to leave the city. 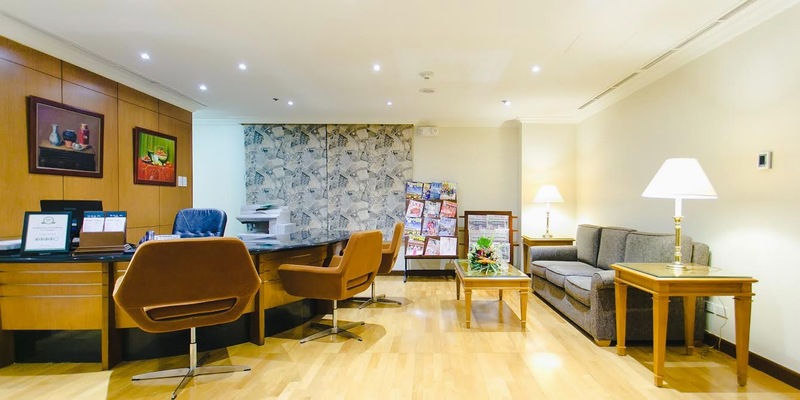 It also makes it the perfect spot for businessmen flying in and out of the country to stay at since its at the heart of one of the busiest business center in the country. After all, the hotel has always attracted corporate clients such as the Asian Development Bank, San Miguel Corporation and Convergys. 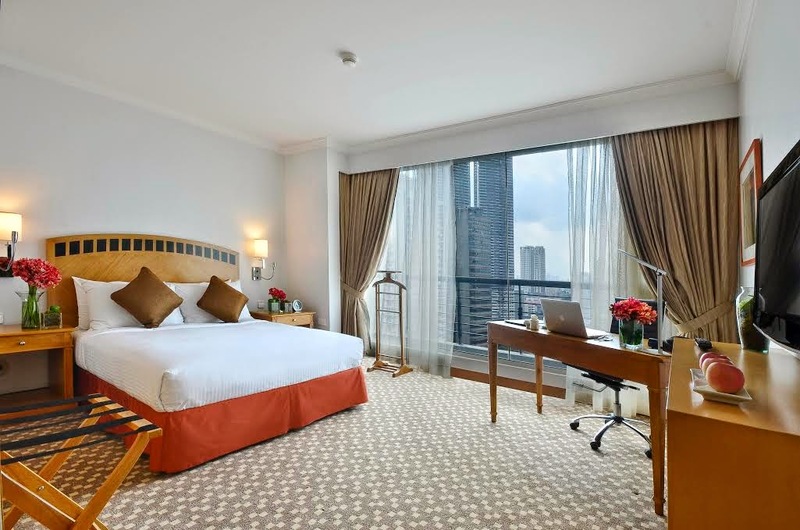 Aiming to meet the ever-changing demands of the progressive traveler clientele particularly in the Ortigas area, Linden has given its spacious rooms a fresh look. As early as now, we have prepared a series of seasonal and surprise promotional activities for our guests to avail of including extra services like providing transport to nearby destinations. Apart from special rates and seasonal promos, Mesclun’s staff are busy cooking up delicious treats for its guests. Our guests have enjoyed the international buffet and new dishes that are whipped up in the kitchen. I have personally seen the rooms myself as well as the view and I can say that it is definitely worth a visit or two. Spacious and with a view to die for, it will feel like a piece of heaven right in the heart of the metro. I'm doing a staycation soon and I am beyond excited to tell you about it. The Linden Suites is optimistic and looks forward to serving its share of the more than 5 million tourist arrivals in the country in the coming year.